Conversations on Covenantalism: What is it? – Called. Convicted. Converted. This is the second post in a little series I hope to be doing on the topic of Covenant Theology. If you have not read the first post which compares Covenant theology and dispensationalism then click here to read it. Today we ask, what is Covenantalism/Covenant Theology. Covenant Theology focuses on one overall major covenant known as the Covenant of Redemption. This is an eternal covenant between the members of the Godhead… The Father chose a people to be His own; the Son paid the penalty for their sin; and the Holy Spirit applied the work of the Son to His Chosen People. This Covenant of Redemption or Grace is being worked out on earth through history in subordinate covenants beginning with the Covenant of Works and culminating in the New Covenant which completes God’s work of grace to man on earth. Unlike dispensationalism, Covenant Theology does not see each covenant as separate and distinct. What I am trying to say is that in Covenant Theology’s division of God’s action in history, he does not work through one covenant, end it, and then move to another covenant (or division). 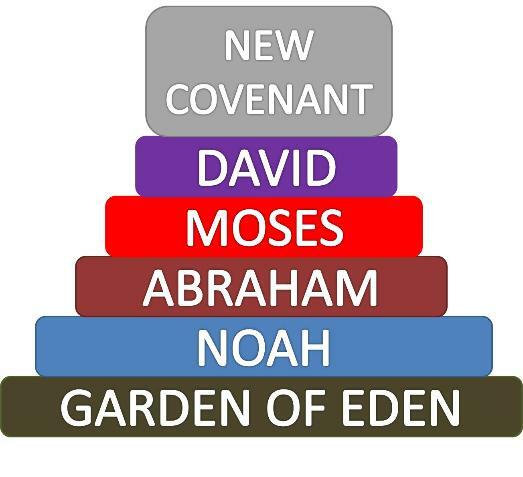 Rather each covenant builds on top of the previous covenant and includes some aspects of the previous ones. All these covenants eventually culminate in the New Covenant. If you will, ‘Covenant Theology’ is much like the development of the character batman… since the beginning of the Batman in 1939 till today; some things have change d in the character of Batman. At the same time much has stayed the same and just progressed to become what we appreciate as the defender of justice in Gotham. You would notice though that he is the same hero- a detective who knows how to fight. He has always had a Batmobile, it is just more developed now; etc. In the same way what one needs to grasp of about ‘Covenantalism’ is that each Covenant builds on the previous one, and now culminates in the New Covenant. So with all this talk about a Covenant, what is it? The usual idea of a covenant is that it is a mutual agreement between parties or persons, whereby each agrees to render some benefit to the other. Think of a marriage Covanent and all the formality around it. While a Biblical covenant has some of these characteristics this definition lacks depth in describing in detail a Biblical Covenant. For example when speaking about a covenant between God and man we have to acknowledge that such a covenant is not one between equal parties. Rather God as the greater is the author and initiator of the covenant, while man as the sinner is the responder and benefactor of God’s grace in granting a covenant. One theologian, Palmer Robertson defines a Biblical Covenant as ‘a soverignly administered bond-in-blood which relates God and man in a life and death relationship’. The word ‘bond’ speaks of the commitment of people one to another as God and man relate and commit themselves to one another in covenant. The phrase ‘bond-in-blood’ speaks to the ultimacy and seriousness of the Covenant between the two parties. The phrase ‘sovereignly administered’ speaks of a covenant as being superintended by God and not by man, since the covenant is initiated by God. The terms are set by God, and man is not a negotiator in the arrangement but the recipient of God’s goodness and grace. Next week we will quickly survey the Covenants briefly. We will also show why the differences between Dispensationalism and Covenant Theology are so important. This will hopefully give you a better appreciation of why issues like ‘The Lord’s Day’, ‘End Times’, ‘children’, Israel as a nation’, and ‘cultural engagement’ have become areas of contention since the advent of Dispensationalism in the 1830’s. Pingback: Conversations on Covenantalism: What are the Covenants? « Called. Convicted. Converted.